No matter how many bags of Nacho Cheese or Cool Ranch Doritos you’ve munched your way through, you might not know everything about the snack juggernaut. 1. THE IDEA FOR DORITOS MIGHT HAVE BEEN BORN IN A DISNEYLAND TRASHCAN. The exact origins of Doritos are a little murky, but at least one story has pinpointed the location of the chip's beginnings as the happiest place on Earth. In its early days, Disneyland featured a Mexican restaurant based around another hugely popular corn chip. The Casa de Fritos offered tamales, enchiladas, and, of course, bags of Fritos. As author Gustavo Arellano recounts in Taco USA: How Mexican Food Conquered America, in the early 1960s a sales rep for Alex Foods, which supplied the Casa de Fritos with its wholesale ingredients, saw cooks throwing out unwanted tortillas. The rep told the cooks that in the future they should save the tortillas and fry them into chips. Patrons liked the improvised chips so much that they went on the menu. As the story goes, the next year, Frito-Lay marketing executive Arch West visited the restaurant, saw how popular the tortilla chips were, and started planning a national rollout for the snacks. 2. THE ORIGINS MIGHT NOT HAVE BEEN THAT MAGICAL. 3. THE LINEUP TOOK SOME TIME TO EVOLVE. Wherever West got the idea, he made the most of it. He sold his bosses at Frito-Lay on marketing the toasted corn chips, and Doritos stormed American shelves in 1966. To give the line more of a Southwestern flair, in 1968 Frito-Lay introduced taco-flavored Doritos. 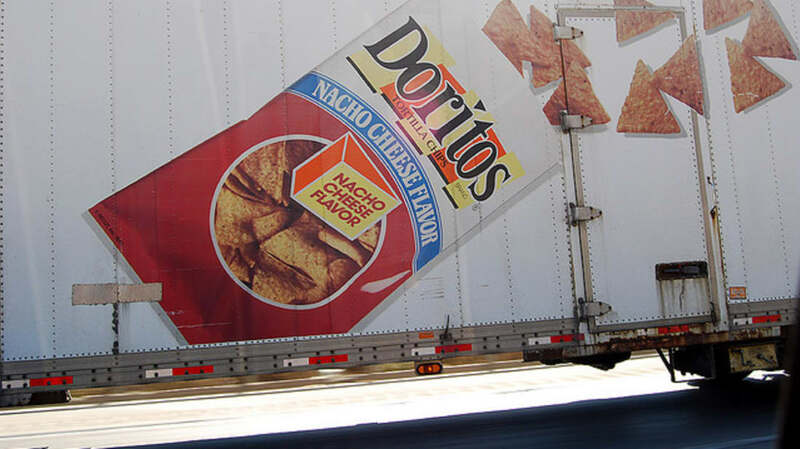 The eventual workhorse of the family, nacho cheese, debuted in 1972, with cool ranch following in 1986. 4. THE NAME IS NO LONGER TOTALLY ACCURATE. 5. A 1992 REFORMULATION HAS A VERY SPECIFIC BENEFIT. When Frito-Lay tweaked the nacho cheese variety’s recipe in 1992, it only set out to improve the seasoning’s flavor to create a nacho cheesier future. Instead, it helped the romantic prospects of Doritos devotees. For whatever reason, the reformulated recipe that included more natural cheese also eliminated “Dorito breath,” the unpleasant lingering of snack aromas long after the last chip was gone. 6. DORITOS GOT AN EVEN BIGGER MAKEOVER IN 1994. By 1994, Doritos was raking in $1.3 billion a year, tops in the snack category. Parent company Pepsico didn’t quit while the chips were ahead, though. Instead, Pepsico invested a reported $50 million in what the New York Times called “the costliest redesign in Frito-Lay's history.” The revamped Doritos boasted a stronger flavor, while each chip was 15 percent thinner and 20 percent larger. The new chips also had rounded corners where the previous version had sharp points, a triumph for both eaters and fans of efficiency. Frito-Lay director of corn products Jerry Vogel told the Times, “It's easier to eat them, without the sharp corners. And a lot of the scrap in the bottom of the bag was from the corners breaking off. It was just a waste." 7. THE FLAVORS CAN GET PRETTY WILD. If you’re bored with nacho cheese and cool ranch, break out your passport. Japan has inventive flavors like Tuna Mayonnaise Doritos and Clam Chowder Doritos; Turkish snackers can enjoy Yogurt and Mint Doritos; and Belgium offers Pure Paprika Doritos. 8. EVEN A-LIST STARS CAN'T ESCAPE DORITOS DUST. 9. Home cooks can make their own Doritos dust. Of course, if you’re not on camera, a little Doritos dust can be a great thing. Cooks have embraced the zesty, flavorful possibility of Doritos dust as a seasoning for everything from vegetables to popcorn. Don’t want to buy a bag of Doritos to harvest the dust every time you make dinner? Epicurious has you covered with recipes for both nacho cheese and cool ranch dust. 10. DORITOS LOCOS TACOS WERE AN EVEN BIGGER HIT THAN YOU THOUGHT. When Taco Bell debuted the Doritos Locos Taco in 2012, America’s favorite vaguely Mexican-ish food franchises made fast food history. Diners may have rolled their eyes at the high-concept taco, but they were so intrigued by the idea that they had to give it a try. At its peak, the Doritos Locos Taco was flying out of stores at a rate of a million orange tacos a day. The special proved so popular that it powered strong corporate profits for both Taco Bell and its parent company, Yum Brands. Fans of the novelty taco were surely worried in May 2015 when Taco Bell announced it was removing artificial flavors and colors from its foods by the end of the year, but nothing can stop the Doritos Locos Taco. Taco Bell quickly announced that co-branded products wouldn’t be affected by the new policy. 11. ALIENS MAY BE CRAVING A BAG. Doritos aren’t even 50 years old, and they’ve already conquered the world snack market. Where can such a successful brand find new customers? Deep space. In 2008, Doritos used a transmitter in the Arctic Circle to send one of its British ads 42 light years away to a solar system in Ursa Major. While the publicity stunt likely didn’t move many bags of chips outside this solar system, New Scientist reported that the agency that operates the station that transmitted the message got a donation from Doritos for playing along.